Ciao a tutti! Sono Melissa, la matta! Oggi sono stata invitata di scrivere un guest post per il bellissimo blog della mia amica Stacy! Sono contenta di essere qui con voi! Hi guys! 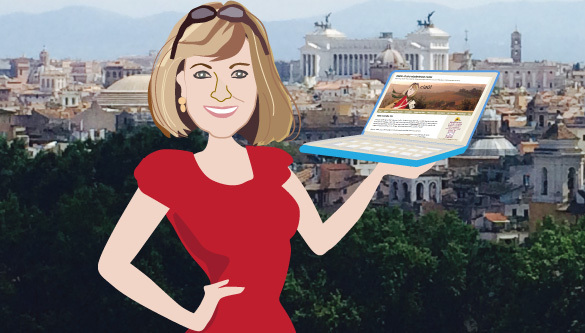 I’m Melissa, from the Studentessa Matta Italian Language Blog! Today I was invited to write a guest post for my friend Stacy’s WONDERFUL blog “Prayers & Piazzas”! I am thrilled to be here with all of you. If you hadn’t noticed, Stacy and I share a passion for the Italian language and all things having to do with Italy. We both go a little crazy for the food, the pasta, the wine, the cheese (yum!) the art, the architecture, the gorgeous men (ahem! ), the shoes, the vespas, the church bells….I could go on forever listing the things I love about il bel paese. Italy is constantly pulling at my heartstrings and I am always ready to throw some clothes in a suitcase and board a plane bound for my favorite place in the world. As a matter of fact, in just a couple of months, in July actually, I’m going to be returning to Italy – la destinazione: Roma! Hey! Wait a minute! I just had a wonderful idea. A GREAT idea actually! Wouldn’t you all like to come to Rome with me!? I’m inviting you, yes YOU to come along and spend of week in Rome with me, living like the Romans do. Put down your wine glass and seriously consider this, because the more I think about it, I would just LOVE for you to join me! Listen to this…it just so happens that I’m organizing a week of Language and Art with my friend Kelly Medford, an amazing American artist who lives and works in Rome. The first thing you should know is that we will have pretty cool digs, close to Kelly’s home and also from what I’m told, Madonna’s apartment! We will be in the heart of the historical section of Rome near the Coliseum. But no worries, there are no lions or gladiators running around the neighborhood these days. Our Roman apartments are located just a few steps from the beautiful church of S. Giovanni in Laterano and my friend Raffaella, who manages the apartments, will see that all our needs are met! Also very close to our home base for the week is the Italian school “Scud’it” that we will be attending during our week in Rome. Now hold on there! Before you get all worried that your Italian language skills are nonexistent, or not up to snuff…RELAX! or as they say in Italiano rilassati! Don’t worry about that! Non preoccuparti troppo! You can be the very beginner of beginners and still come along and start your Italian language learning journey with us. Our “professore” Roberto Tartaglione and his colleagues at the school will instruct all of us at whatever level we are currently at. Roberto is very cute and produces these delightful on-line videos, called Grammatica caffè in which he teaches an Italian lesson in the time it takes to brew an espresso in a Bialetti coffee pot. Speaking of coffee…did I mention I LOVE ITALIAN COFFEE? Italy is THE MECCA of espresso so, don’t worry, we will be taking lots of coffee breaks to help us keep conjugating verbs throughout the day. Oh, and don’t forget there will be gelato every afternoon too! Just sayn’! Now, the next best thing about the trip that Kelly and I have planned for you in July, is that after pranzo (lunch) we will be roaming around Rome with Kelly and she will teach us how to sketch and draw. We also will be keeping our drawings in special journaling notebooks that Kelly will make for us. Isn’t she the best? Now again, don’t get all worried that you don’t paint like Leonardo, or that you are not an artist like Michelangelo, because you don’t need to be an accomplished artist to participate in one of Kelly’s art workshops. Indeed what she teaches is a new way of seeing. So, even the smallest of sketches captures and records a mood or a special moment. Kelly & I both believe that art is not just something for gifted individuals. Rather, it is a personal experience that we can all develop and enjoy. Can’t you just imagine yourself sketching in the Borghese Gardens, or as you will soon learn to call it like a real Roman, the Pincio?. Or, better yet, can’t you just see yourself in a quaint little Roman street corner, capturing a detail of one of Bernini’s Baroque fountains? 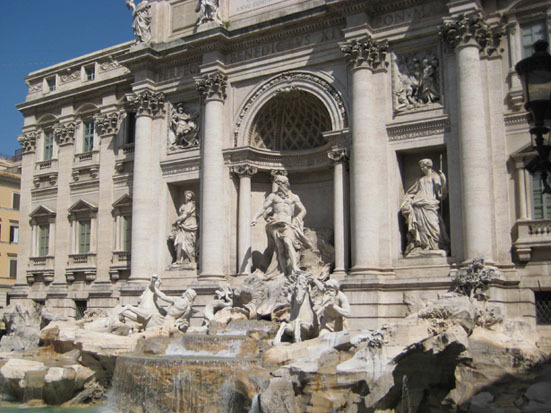 We are in Rome to have fun and experience “la dolce vita” vero? So, if you get the urge to throw your paint brush away and run and jump in a fountain at midnight…relax, Kelly and I will be there to pull you out! Speaking of evenings in Rome, they can be quite romantic! We will spend the warm summer Roman nights dancing in the parks, listening to music in Trastevere, attending FREE outdoor concerts and picnicking in the hills on the outskirts of Rome – with all the wine you can drink! Now doesn’t that sound like fun? Did I mention that there will be good food too! We will be eating in local trattorias that Kelly will scout out for us. If you travel with us, you know you will be getting lots of great insider, street knowledge that normal tourists in Rome aren’t privy to. You will also get a chance to meet many of our Italian friends. Just to drop a few names, you will meet Lucrezia from “Learn Italian with Lucrezia” and Chiara from “Runaway Day Dreamer”. These two gals are popular Italian language bloggers who will be more than happy to chat with you in Italian and help with any after hour, Italian language questions you might have! Pretty sweet right? Well, I for one, can’t wait. Non vedo l’ora! 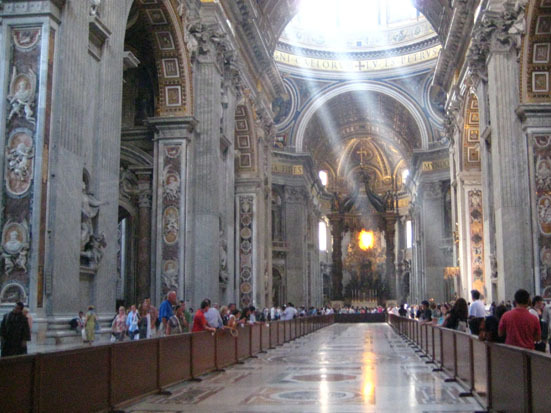 I hope you decide to join us in Rome this July 5-14! What are you waiting for? There are only 10 spots and they are filling up! If you would like more information, roam on over to the Studentessa Matta web site to the page: To Rome with Kelly & Melissa 8 days of Language and Art where you will find an abundance of information about our Rome trip, many pretty pictures and an on-line form to make your reservation. Let’s do it! Let’s go to Roma together in July! You won’t regret it. Who knows, you might just come home with a notebook full of pretty pictures and speaking lots more Italian than before you left. You might even come home with a couple of pairs of beautiful Italian leather shoes in your bag! You never know what might happen when you go a little crazy in Rome with me! Un grande abbraccio da Melissa… a presto! Tags: Italian, Italian Language and Art Vacations, Italian Language Vacations, Italy, Rome, Studentessa Matta, To Rome with Love with Kelly and Melissa, Travel. Bookmark the permalink. Previous post ← Call for Submissions!